Computer labs and Dawg Prints are inseparable. When you are sitting at a UW Library or lab computer, your print job is just a leash length away. Simply send your file to print, grab your Husky Card, and retrieve your job in seconds at the nearby release station. NOTE: Print drivers will be asking for a NETID or an owner name for your print jobs. Please use your NETID or pick an owner name that is one word, unique, and memorable to you. Make sure there are no spaces in either of your NETID or owner name otherwise you might not find your print job when you go print it at the release station. Print drivers are not the only way to print to our Dawg Prints printers. 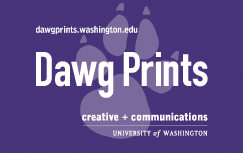 You can now alternatively upload your documents at My Print Center and print them at any of our Dawg Prints locations.